BrookfieldAngler.com: Final Results of the GLKFS Salmon event and overall series!! EPIC!!! Final Results of the GLKFS Salmon event and overall series!! EPIC!!! This past Saturday was the final stop in the Great Lakes Kayak Fishing Series and the target fish was my absolute favorite freshwater fish to chase in the kayak - Chinook Salmon. Going into the final event, I was in 4th place for the overall standings and 47.5" behind first place. Quite frankly, that seemed like an unsurpassable amount of inches to make up! With that, ultimately, my goal for this stop was just to win the stop and rack up some more points for kayak wars - and obviously have a ton of fun!! The latter was pretty much guaranteed - the first two not so much. Teddy and I carpooled all the way up to Manitowoc, WI after I got home from work on Friday. We arrived at the campground on that night around 7:30, set up the tent, grabbed some grub, and were on the water by about 8:30 to start prefishing. As we peddled out of the marina, we ran across a couple of other competitors who were coming in and they told us that the guy in first was out earlier. "Did he get any fish? ", I asked. I was not feeling good about my chances when one of them responded,"He got two. " "Good for him" I thought as we continued on our way. Truth is, he's a younger guy and could definitely use the new 2014 Hobie Outback that the winner of the series would get. As soon as we hit about 17 feet of water, we started dropping lines. For the next three hours, I switched out lures every 20 minutes so I could find something that worked. While I marked a ton of fish, I couldn't get a single one to bite. I was realllly not feeling good about my chances now. Still, I was marking spots where I found good concentrations of fish on my maps so I could go back the next morning. The alarms on our phone were blaring at 4:15am which felt entirely way too soon to wake up. I hit the snooze and grabbed an extra 10 minutes before finally mustering the energy to actually wake up. Since the truck was already loaded, we had enough time to stop at McDonalds for some coffee on the way to the Manitowoc Marina where the event was being hosted. Shot gun start went off at 5:30 and we were all off to the races!! I'll fast forward from this point until about 9:30am when I finally had my first fish strike! I peddled to set the hook, grabbed the rod, and got ready for what turned out to be an almost ten minute fight! I was trolling with 75 feet of line behind me so I had my work cut out for me. At first, I was gaining line pretty quickly. Once the fish saw the boat, it quickly took me back where we started. This happened twice more before I was able to get her into the net!! I was beyond stoked!! She ended up coming in at 37" long which was a stellar start!!! OK - 1 down and 2 to go!! It took until 12:30 for me to get another salmon into the kayak thanks to a couple of drive-bys and a stupid mistake on my part. As a note, if you are trolling more than one line, focus on the line with the fish instead of trying to clear the other lines. I never saw the fish, but judging by the line it was taking out, it was bigger than the first fish. Anyways, around 12:30, I got slammed once again. This time, I said to hell with the other line out - I'll deal with the mess later! 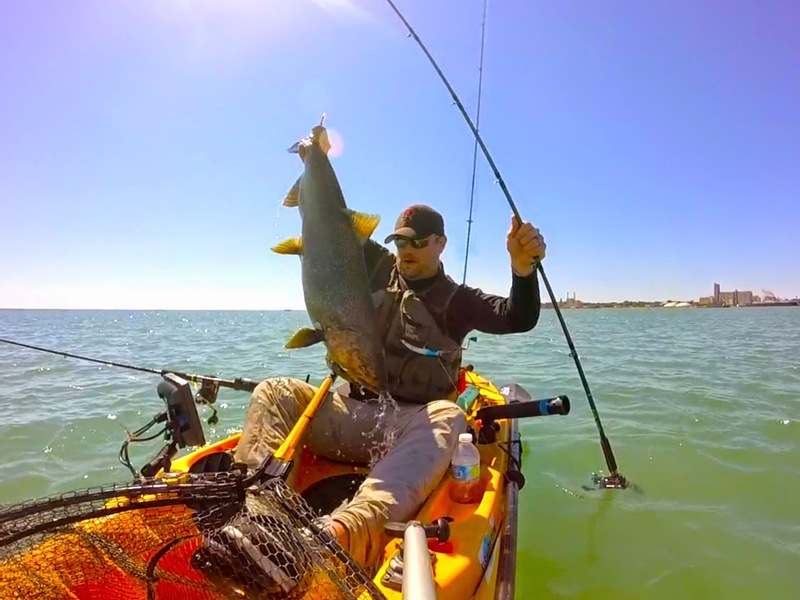 This fish, unlike the first one, did everything it could to escape the kayak. It was another epic ten minute battle but at the end, she was tired and ready to accept her fate as I reached down, grabbed her by the tail, and brought her into the kayak!! She ended up at 34" and left me needing just one more fish to get my limit for the tournament!! I still didn't think I had any chance of winning the overall series but I did figure if I could get my limit, I'd at least have a shot at the tournament! Come on fish number 3!!! The official time to get into line was 2:30pm. Every minute after that would cost me an inch so time was definitely running out. Finally, right around 1:45pm, I got rocked! I set the hooks, grabbed the rod, and watched for two minutes as a bright silver fish put on a display that could only be rivaled by a tarpon. Every time this fish launched out of the water, fellow kayak anglers and boaters alike all let out cheers and encouragement as I prayed its strategy to spit my lure didn't work. Finally, the acrobatics stopped and the fight turned into a tug of war. I had the fish in front of the kayak this time and it was pulling me forward at a little over 1 mph. That's when I heard another friend and competitor yell out, "YOU GOT A DOUBLE!!!!" as he was trying to reel his lines in so he could come over and give me a hand with the second fish. I peddled forward as fast as I could to hopefully get the hooks in well enough to buy me enough time to figure out how to land both fish. After a short time, the second fish was gone. Honestly, I was kind of relieved as I was still focused on a fish that was giving me one of my top 3 fights of all time. With a grab of the tail, an absolutely gorgeous 36" - barely starting to turn - silver king salmon was in the boat! THAT'S 3 BABY!!!!!!!!!!!!!!!!!!!!!!!!!!!!!!!!!!!!!!!!!!! YES YES YES!!!!!!!!!! The fight was so epic that I never had a chance to turn the GoPro on so I don't have any action shots but here she is about 20 minutes later at the dock for registration. After getting my three fish measured and registered, it was now just a waiting game for the last anglers to make it to the dock. After everyone was in and had all their fish registered, it was clearly a great day of fishing for a lot of people. After all the calculations were complete, it was results time!!!! The butterflies were definitely strong in my empty stomach. WOOHOO!!!! I was beyond excited!! The prize for big fish was an awesome Bubba Blade Fillet Knife!! No friggin way?! Can't believe how it all came together!!!! So friggin excited!!!!! I seriously couldn't believe it. Woz and I both came into this event without any real thought of winning the entire thing. We definitely both had hopes for this individual event but a 2nd place finish for Woz on the entire series and a 1st place for me was a shock. Even as I write this post - 2 days later - I am still beyond excited. Ultimately, I have so many people to thank including my personal sponsors - especially Lucid Fishing and FSA Custom Rods. I also have to thank this crazy group of friends that chase these fish from kayaks every year who all teach each other everything they know. 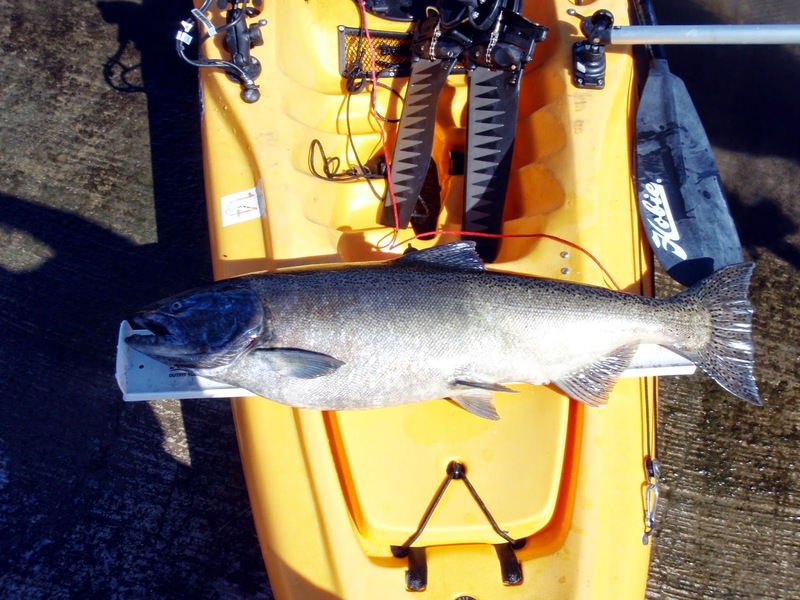 Its a tight-knit group that has a ton of knowledge when it comes to kayak salmon. I also have to give my hats off to Colin Belle and Rob Wendel who worked their butts off to put this series together. Between the planning and finding sponsors, they had a full time job on their hands. Thanks for hosting the events!! and I'm sure Im missing a few...Thank you so much for all of the gear and cash prizes throughout the entire series!! Of course - Thanks to my wife for letting me fish so much!!! It's something that I truly love and am so happy to have a wife that let's me get out there as often as I do. Celebration dinner is coming!!! Finally, here I am with Colin Belle (the organizer and Regional Midwest Hobie Prostaff member) and Anders Larson from Manitiowoc Marina with the grand prize for the series winner - a brand new 2014 Hobie Outback!!!! I've had a blast fishing this series and have met a ton of great people and kayak anglers. 2014 is the first year that I decided to start fishing competitively so I am beyond shocked at how well the year has gone. Can't wait until the 2015 season to start!!!!!!!! For the rest of the year, I'll be chasing salmon and musky until the end of October when my family will be welcoming the newest edition to the family...our 2nd baby boy!! Once again , congrats to my son-in-law for killing all the categories. You got some great prizes. "Thanks to my wife for letting me fish so much!!! It's something that I truly love and am so happy to have a wife that let's me get out there as often as I do. Celebration dinner is coming!!!" Thanks and nice meeting you! Thanks, Sims! Have you taken your boat out yet?? I sure hope the answer is yes!!! Congratulations to the both of you!!! That really is awesome that you guys took 1st and 2nd! Thanks, Carf! Was pretty friggin pumped!! Teddy slayed them for that jump to 2nd! !